For those who haven't installed Mac OS X from scratch before, some of the steps you go through during the process are selecting your country and filling in registration information which optionally includes your address. 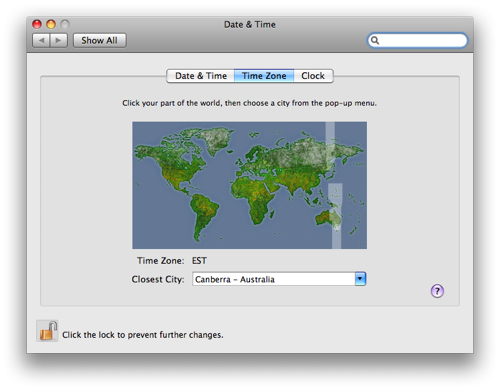 Despite entering "Adelaide" as my city and "South Australia" as my current state of residence, Mac OS X is still configured to use the Australian Eastern Timezone as shown above. This has caught me out so many times I can't count! Fortunately I haven't missed any classes or meetings as a result of looking at a freshly installed Mac, but the opportunity is still there. Is it normal for Apple software to just choose the most populated timezone in a country, or to select the timezone where the capital city is located? Why does it ignore the state you enter before? For some reason I can't quite understand, I never had this trouble in Singapore.